When Jesse Tran started his International Business studies at the Aalto University’s Mikkeli campus in year 2012 he did not have any clue how fast his dream of becoming a founder of a startup would come true. Jesse had just moved to Finland and thought it would take an extremely long time to establish a network in a new country to start building his own company. In 2015 Jesse heard that there was a course at Aalto that included a cool study trip to Cape Town, South Africa. He applied to AVP’s Aalto Fellows Program with this study trip on his mind. During the Aalto Fellows Program he got inspired about startups and realized that his dream of becoming an entrepreneur was closer than he had thought. He understood that the key is to know the startup ecosystem and how can startups most effectively raise funding. As a student from Vietnam, Jesse didn’t have any ties to the Finnish startup scene. Through Aalto Fellows he had the opportunity to get valuable insight into the ecosystem and learn how it actually works. Aalto Fellows Program is an exciting five-month study and work program designed to develop a theoretical and practical understanding of techniques for growing companies. The program also includes a paid internship, which Jesse completed at the e-commerce company DealDash. The firm was growing fast and Jesse completed his tasks in such a good manner that the internship lasted only a month, after which he was promoted to Brand Partnership Manager. As mentioned, AVP inspired Jesse to become an entrepreneur. He decided with Kien Bui, Niklas Siven and Mikael Uusivuori to take part in Summer of Startups ‘16, which offers early-stage growth companies a summer of a lifetime. The accelerator program, organized by Aaltoes, includes personal mentoring by experienced entrepreneurs and investors, a grant worth several thousands of euros, support from the community and a roof over their heads. In the beginning of August, Jesse’s company, FactoryFinder, won the Summer of Startups Demo Day, which gathered over 600 people to witness the pitching competition in Otaniemi. 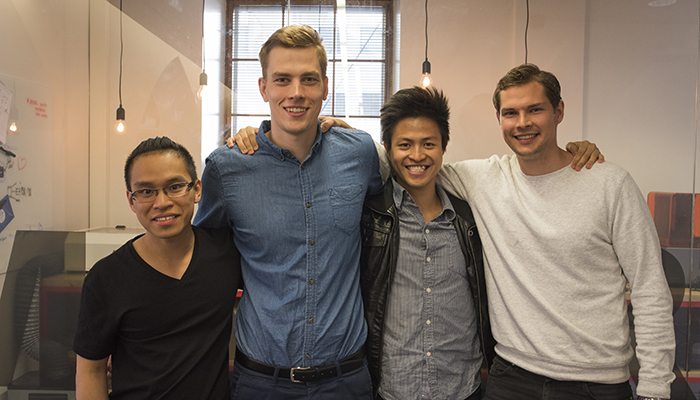 FactoryFinder’s founders Kien Bui, Niklas Siven, Jesse Tran and Mikael Uusivuori. FactoryFinder is a digital platform for apparel manufacturing that helps small and medium-sized fashion brands to easily find responsible and high-quality manufacturers. Jesse and his team founded the company to change the future of manufacturing. They want to be the number one choice for brands and designers to make their products, by offering an effortless and sustainable way to find, connect and work directly with apparel manufacturers around the world. Manufacturers must comply with the Business Social Compliance Initiative standards in order to gain access to FactoryFinder network. A six-person team located in Vietnam is responsible for managing relationships with manufacturers as well as quality control. FactoryFinder has so far attracted over 20 brands from Finland, Sweden, New York and Los Angeles and they have huge potential for rapid international growth. They are recruiting new employees for expansion next year so stay tuned if you are interested in working for an inspiring and fast-growth technology startup. Aalto Fellows Program was not the only AVP’s branch that inspired Jesse to become an entrepreneur. Our Thought Leader’s Talks (TLT) have inspired him as well. Lastly, Jesse shared that entrepreneurship requires so much more effort and commitment than he had originally thought. Check out the video of the below to hear what Jesse said about his experiences with AVP.